This article reviews the assumptions that underpin the commonly implemented Chronic Disease Self-Management models. Namely that there are a clear set of instructions for patients to comply with, that all health care providers agree with; and that the health care provider and the patient agree with the chronic disease self-management plan that was developed as part of a consultation. 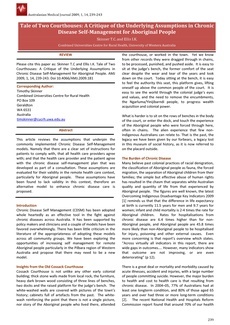 These assumptions are evaluated for their validity in the remote health care context, particularly for Aboriginal people. These assumptions have been found to lack validity in this context, therefore an alternative model to enhance chronic disease care is proposed.